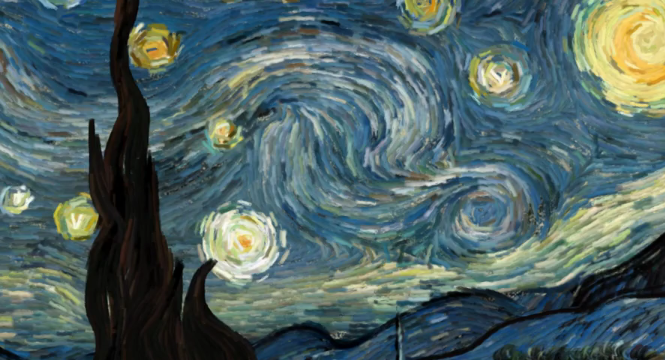 In what I can only describe as perhaps the most impressive application of openFrameworks I have ever seen, Petros Vrellis‘s interactive animation of Starry Night will surely blow your mind. Just when I thought that everything has been done, something like this pops up and knocks me off my pessimistic high-horse. As you can see in the video below, the painting is beautifully brought to life in a subtle animation, but the real magic happens when you interact with the piece, as if you were painting the work of art yourself. This is just one example of the magic locked inside code and projects like openFrameworks. WordPress is right. Code is poetry, and art is what happens when brilliant minds learn how to bend it to their will. About 80.000 particles move around with a fluid-like algorithm and are drawn as small opengl minimaps. I get about 30fps at 1920×1080, with an intel i5-2500K, and a geforce GTX560. Multitouch tracking is made with ofxKinect and ofxOpenCV. The music is the result of much experimentation and luck. A fluid simulation gently creates a flowing fabric from Van Goghs impressionist portrait of the Milky Way and night sky over Saint-Rémy in France using the thick paint daubs as the particles within the fluid. A touch interface allows a viewer to deform the image, altering both the flow of the particles and the synthesized sound, and then watch it slowly return to its original state. The sound itself is created using a MIDI interface to create a soft ambient tone out of the movement of the fluid that underscores the soft movement. Beauty through simplicity at its finest and most playful. Check out all of TNW’s favorite experimental projects and apps here.